The Divinely Inspired instrument recorded on this CD has 117 strings. All the strings are 7 ft. long. They are precisely tuned to frequencies that generate infinite harmonic overtone ratios hidden within the fundamental note of each string. These frequencies emanate organically & combine mathematically to create exquisite cosmic symphonic orchestrations that unfold geometrically. I call them "audible fractals". Within these overtones series you will hear fathomless galactic choirs & instruments unimagined. It is hard to believe this CD is entirely acoustic! There are no synthesizers, no computer generated effects, etc. I use only my fingers on the strings which are attached to a wooden acoustic resonant chamber (like a giant guitar body or a massive cello) It is designed to be played while a human being is literally lying on top of it. Even more difficult to believe is that all the strings are tuned to only two notes. (D&A) This phenomena is known as the Lambdoma Sequence. 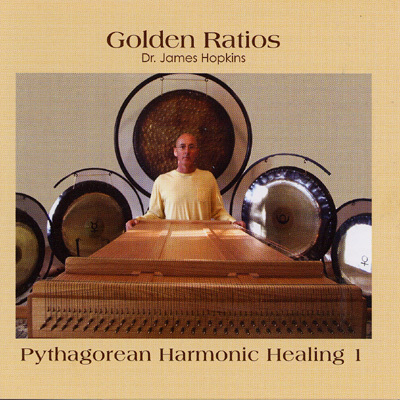 Golden Ratios is the first in a series of five compact discs that will be released by Harmonix Healing.